So mommy and daddy made me a happy pug this whole weekend. First off my Saturday started off great! I woke mommy up nice and early and we watched a movie together...well she watched I went back to sleep on the sofa. Around 9 we woke daddy up...it was time to go to the dog park and I wanted to play. While daddy was in the shower, mommy got good news in her email. My bestest buddy Spencer was gonna join us at the dog park...so the day just got better. When we got to the park a short while later, Spencer and his mommy were just getting out of the car, fun was going to start from the second I got there! Spencer and I played for over an hour (well we did take breathing brakes...darn pug snouts) and we even had the park to ourselves. We chased each other and tried to eat wood chips. We even had to defend the park from something unknown. Heh he started barking, I was just the backup. After our playdate was over, mommy and daddy took me to a doggie boutique and I got a snazzy new pink leather collar...with flowers on it, got to reinforce the female side of me. We ran some other errands, both dog and human in nature, but by the end of the afternoon I was one sleepy pug. I was just settling down to take a nap, when daddy starts to sweep. The coolest thing happened when he did that...this magical barrier that stops me from going from "my room" to the rest of the house was removed. I could venture to the rest of the house. I just had a taste of pug freedom....and I couldn't seem to get enough. It was so exciting! I explored all the rooms and jumped up onto the sofa. WOO HOO!!! I soon found the reason for my sudden freedom, company. After all was said and done I was one exhausted pug. I was fuzzled and cuddled and played with all day long...and I was in heaven. So today is Sunday and I'm sitting by mommy's feet. She's on the computer, and I am one free-roaming belly button. Oh I am super jealous. I wish I could have gone too - that Spencer B is very cool. And don't tell Jenny this, but you are THE cutest little mostly-she pug I've ever seen. Ah thanks Puglet. I wish you lived in the east bay. Spenser and I usually get to play on Saturday, at least we try to. We love each other very much and our mommies like to talk pug. Maybe some day soon we can all get together and play. I can't wait to meet you and Dutch. Bellatrix...sounds like you had a pretty great day! I love going to the doggie boutiques...mommie always gets me something tasty! You gots to show us a picture of your new collar...sounds very cute! Thanks my daddie will need all the help he can get for his big test! Hiya Dutch, I am so gonna take pictures of my fancy new collar. It's so pretty and girlie. Mommy said it makes my eyes sparkle. 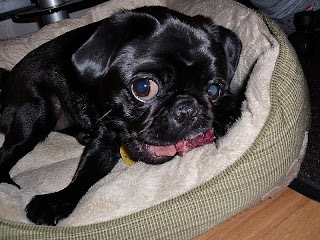 She's so silly, those are just my pug eyes, and eveyone knows pug eyes are the best. I had so much fun with you on Saturday. I love when the park is quiet and we get to have the run of the place. Thank you for helping me defend the park from the unknown - you're a great bud. I hope we can get together every weekend for our chase time. My mom loves that you get me out of my shell. Thanks for being you Bella, it helps me be me. Aww anytime Spencer, what are bestest friends for? I love to play with you all the time. Maybe we can hang out soon...once this rain goes away.